Achilles Video Slot Guide & Review - Casino Answers! 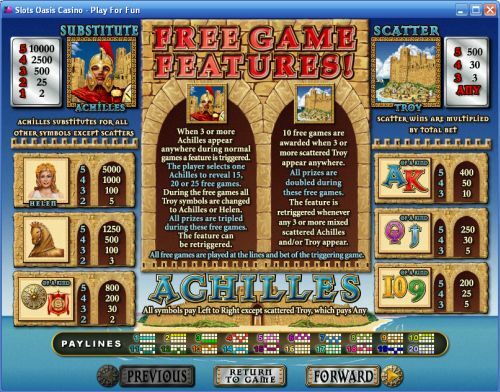 Achilles is a 5-reel, 20-line video slot developed by Realtime Gaming, featuring a wild substitute symbol, scatter wins, multipliers, two free spins features and a progressive jackpot. You can play the Achilles Real-Series Video Slot at Bovada. Bets on the Achilles slot machine are $0.01, $0.02, $0.03, $0.04, $0.05, $0.06, $0.07, $0.08, $0.09, $0.10, $0.25, $0.50, $1, $2.50 and $5 per line. You can select from 1-20 paylines on the Achilles video slot. You can bet as little as a penny on the Achilles penny slot up to the maximum total bet of $100 per spin. Achilles has a good betting range, suited for any online casino player. You can manually skill stop a spin by pressing the “Stop” button during any spin you make. To play the Achilles slot game, select your bet and use the “Spin” button to spin the reels. The highest paying symbol on the Achilles online slot game is the Achilles symbol. If 5 Achilles symbols land on a selected payline, you will win the 10,000 coin top jackpot. The Achilles symbol is wild and will substitute for all other symbols except for scatters. Other high paying symbols on the Achilles video slot are the Helen (5000 coins) and Horse (1250 coins) symbols. The scatter symbol is the City of Troy. 3, 4 or 5 Scattered Troy symbols will pay out 3X, 30X or 500X your total bet. A 500X scatter win is huge and you can win it along with the other large jackpots on the Achilles video slot at Bovada! When 3 or more Achilles symbols appear anywhere during the regular slot game, you will trigger the free spins feature. You will select one of the Achilles symbols to win 15, 20 or 25 free spins with a 3X multiplier. During the free spins feature, all Troy symbols are changed to Achilles or Helen symbols. All prizes are tripled during the free spins feature. The Achilles free spins feature can be re-triggered. If 3 or more Scattered Troy symbols appear anywhere on the reels of the Achilles video slot, you will win 10 free spins with a 2X multiplier. All prizes are doubled during the Troy free spins feature. The Troy free spins feature is re-triggered whenever 3 or more mixed Scattered Achilles and/or Troy symbols appear on the reels. The Achilles video slot has a progressive jackpot, which at this time is at a modest but very winnable $5,770 and rising steadily. The Achilles Progressive Jackpot is won at random, so you don’t need any winning combinations to trigger it. Any spin you make can win you the progressive jackpot. Progressive Jackpot wins are added to other wins. Random Jackpot contribution is no more than 1.5% of the total Return to Player. Hit the “Autoplay” button to open the autoplay settings. You will be able to set the number of spins, set it to stop when the jackpot is won, stop if a win exceeds or equals (any amount you input), stop on any win, stop if your balance increases/decreases by any amount you input and stop once the feature is triggered. You can stop Achilles’s autoplay mode using the “Stop Auto” button to deactivate it. 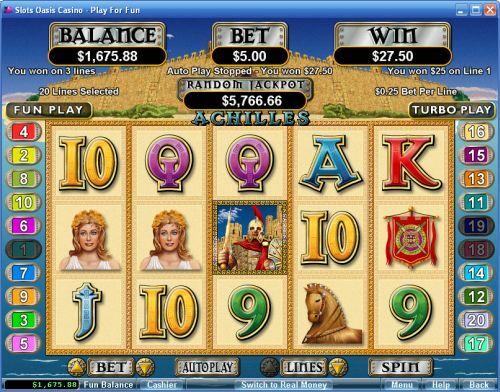 The Achilles video slot has many large payouts to offer, which would probably be the highlight of the video slot. The third highest payout is 1250X, which is higher than the top payout on some video slots. This isn’t even factoring in the progressive jackpot! In addition to that, Achilles has not one, but two free spins features. At least as far as the player is concerned, you can never have enough special features, especially when the spins don’t cost anything. You can play the Achilles video slot for real money by signing up and making a deposit at Bovada! Are USA players able to play the Achilles online slot for real money? Yes, American players can play the Achilles Real-Series Video Slot for real money at Bovada. Is there a no-download Instant Play version of Achilles that I can play for free? Unfortunately, RTG online casinos only offer a limited number of video slots in their Flash casino. You can play these video slots in your browser by visiting Bovada.